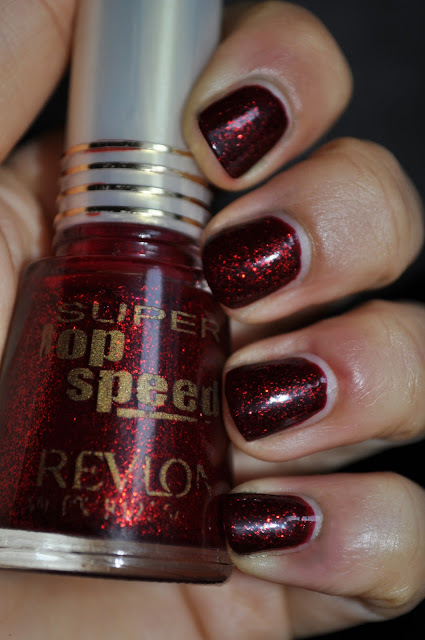 This weeks manicure is Revlon's Super Top Speed Polish in Firecracker over Deborah Lippmann's Just Walk Away Renee. Just Walk Away Renee is a lovely berry chocolate cherry Polish. I own about a million of these shades but I absolutely love these "looks like blood" on the nails lacquers. Just Walk Away Renee goes on like a dream with it's creme/jelly formula and glossy finish. 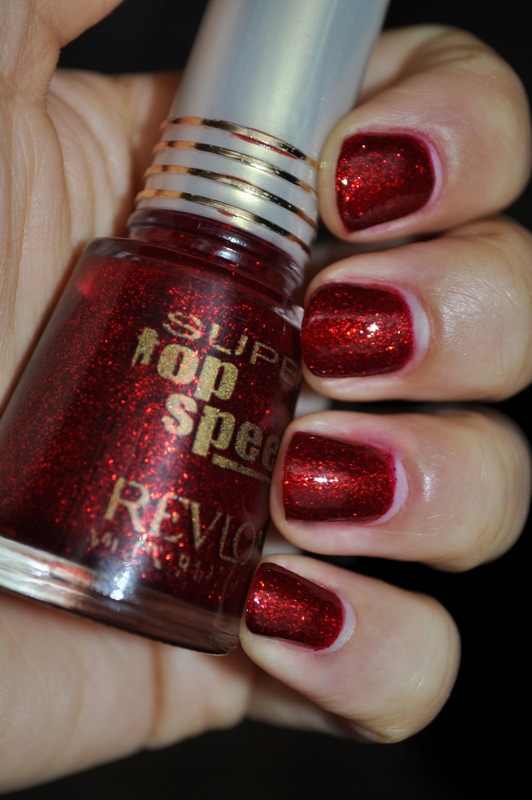 Revlon's Firecracker is that perfect ruby red slippers glitter polish. The Formula is jelly-like and applies on the nails like so. I applied only two coats. 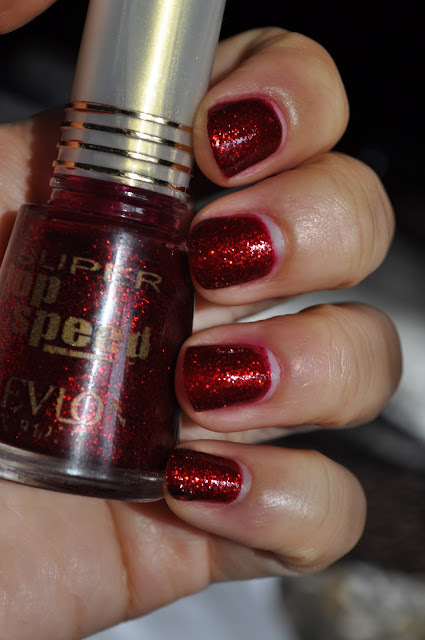 Firecracker dries to a smooth and sparkly finish. Deborah Lippmann's Just Walk Away Renee retails for $16.00 and is available at nordstrom and at various other retaliers where Deborah Lippmann is sold. 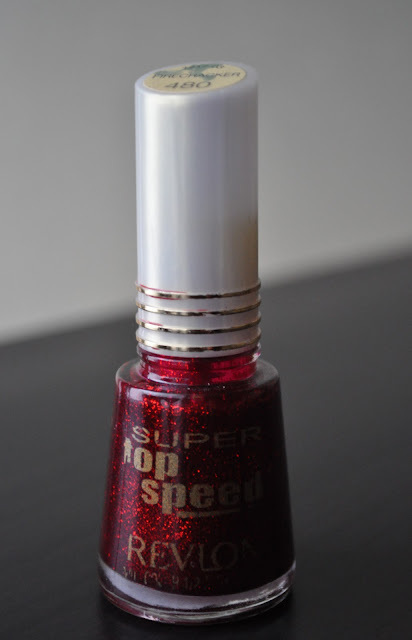 Unfortunately, Firecracker has gone the way of the dodo but there are several similar red glitters available like Deborah Lippmann's Ruby Red Slippers or China Glaze's Ruby Pumps. 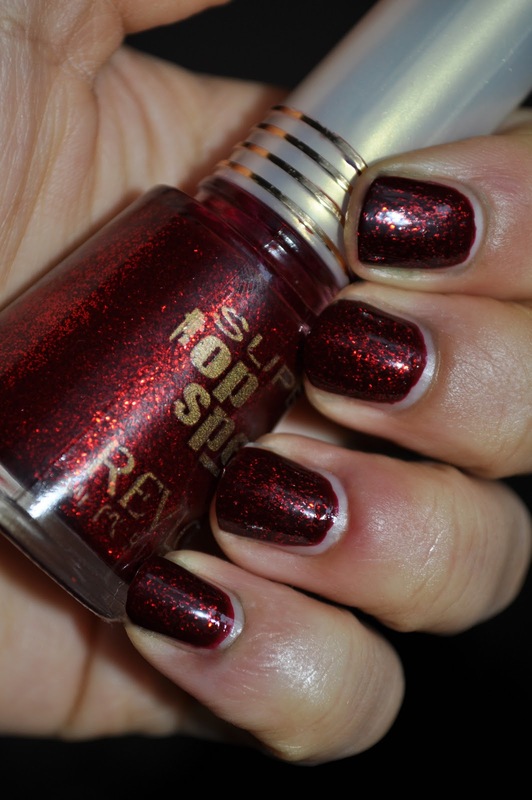 What is your favorite red glitter polish? I've had this polish FOREVER! I don't have Dripping Rubies, must get now! I actually found out the other day that i have 3 of these! but one is different than the other two! i can't find any online info on it but it appears revlon made two versions of firecracker. I noticed it because one of the bottles caught my attention when i was looking at it in the light. it had specks of silver glitter in it while the other two had only red. i looked them over good and noticed all have the same name 'firecracker' and number 480 but one bottle has a 6 digit number on it (the one that contains silver in it) that is different from the other two bottle's 6 digit number (they use to put these extra numbers on their old bottles). i can't believe i have a odd ball revlon firecracker! boy am i glad i decided to go through my old polishes.